Award-winning Fogo de Chão (pronounced fo-go dèe shoun), the authentic Southern Brazilian steakhouse, recently opened its 20th U.S. location in San Diego on 6th Avenue in the heart of the city’s historic Gaslamp Quarter inside the Borders Building. 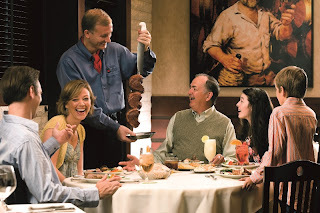 The restaurant’s dining experience is based on the centuries-old gaucho tradition known as churrasco, the art of roasting meats over an open fire. A prix fixe menu features freshly grilled meats carved tableside, as well as an extensive salad bar and authentic Brazilian sides. Fogo de Chão specializes in espeto corrido, or “continuous service,” where a team of Brazilian-trained gaucho chefs prepares and serves 16 different cuts of beef, lamb, chicken and pork. Guests decide both the pace and the portions of their dining experience by using a small, double-sided disc that signals to the gaucho chefs that they are ready for additional service—green queuing servers to continue bringing meats and red signaling stop. 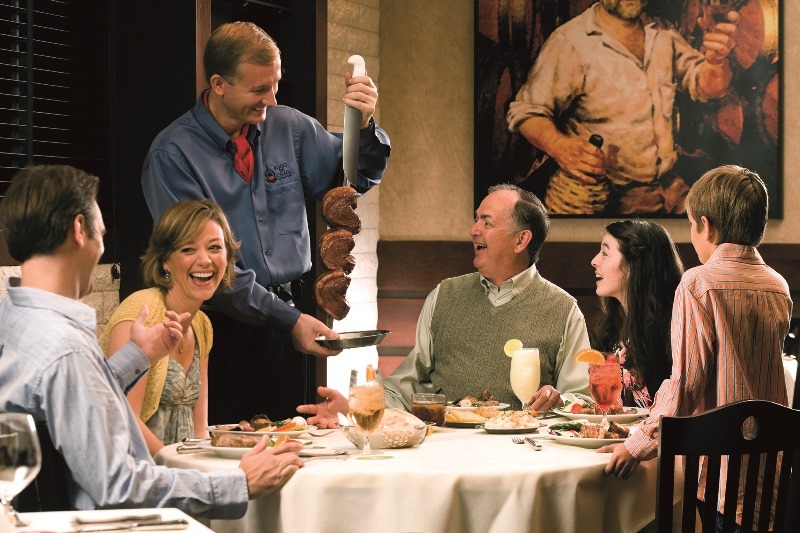 The traditional Southern Brazilian churrasco prepares a variety of perfectly cooked meats. Picanha, the prime part of the sirloin, is seasoned with sea salt and flavored with garlic, while the Fraldinha, is a marbled cut from the bottom of the sirloin, is also seasoned simply to complement the natural richness of the meat. 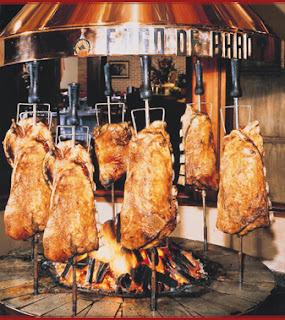 Cordeiro is an offering of fresh lamb served as lamb chops or leg of lamb sliced off the bone. While meats are at the forefront, the restaurant also features a gourmet salad and sides bar with more than 30 selections, including smoked salmon, sun-dried tomatoes, hearts of palm, tabbouleh salad, jumbo asparagus, cured meats, artisan breads and imported cheeses. A crowd favorite is the Pao de Queijo, authentic Brazilian cheese bread made from yucca flour that is also gluten-free. Fogo de Chão offers a 200-label wine list for which it has received Wine Spectator’s Award of Excellence for the past nine years. Guests may also sample the Caipirinha, made from Brazilian liquor cachaça, as well as Guarana Brazilian soda and zesty Brazilian lemonade. Desserts include the restaurant’s signature papaya cream, made with fresh papaya, vanilla ice cream and Crème de Cassis liqueur, as well as South American flan, crème brûlée, turtle cheesecake, molten chocolate cake and key lime pie. Blending seamlessly into the architecture and style of the historic Gaslamp Quarter, the rich brick masonry of the building’s exterior continues into the 12,000 square-foot interior, expressing warmth and permanence of the architecture and surrounding scene. A new entry canopy with exposed steel framing and teak paneling add depth to the building’s corner entry. Above the canopy, a marquee style “Fogo de Chão” sign reflects the style of the historical theaters and hotels in the neighborhood. Hand-blown Murano glass sconces bring elegance to the existing brick pilasters along the sidewalk. The interior palette is a mixture of Brazilian slate, exposed brick, custom glass tile mosaics and warm rich woods such as Brazilian rosewood, walnut and maple. Wine plays a large role in the restaurant’s interior design, both in the exhibition glass wine room as well as large custom wine casks and displays throughout the space. Custom murals cover the walls with depictions of Southern Brazilian culture and the gaucho lifestyle. The expansive restaurant boasts seating for 350 guests and offers five private and semi-private dining rooms for group events, meetings and celebrations. Equipped with AV capabilities and Internet streaming, the spaces are ideal for groups, meetings and events. An outdoor patio – a new addition to the space – features seating for up to 20 people. The windows along 6th Avenue have been transformed to full height bi-fold doors, exposing the interior of the vibrant bar. 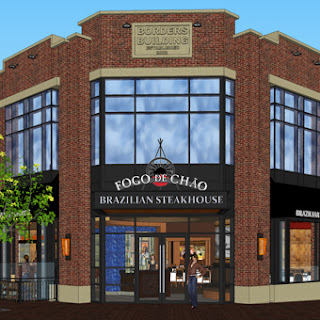 Fogo de Chão San Diego is located at 668 6th Avenue, in downtown San Diego and the hours of operation and prices are as follows: Lunch – $29.50 (Salad Bar Only - $22.50) - Monday – Friday: 11:30 a.m. to 2:30 p.m.; Dinner – $46.50 (Salad Bar Only - $28.50) - Monday – Thursday: 5:00 p.m. to 10:00 p.m., Friday: 5:00 p.m. to 10:30 p.m., Saturday: 4:30 p.m. to 10:30 p.m., Sunday: 3:30 p.m. to 9:00 p.m.
Children six years of age and under enjoy complimentary dining. Children seven to 12 years of age dine at half price. Beverages, desserts, taxes and gratuity are additional.